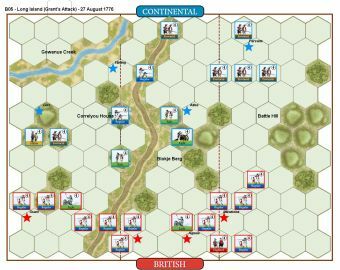 The British campaign plan was to send General John Burgoyne from Canada, down the Hudson River and General Henry Clinton, up the Hudson River to capture Albany, which would spell the end of the American resistance in the Hudson River valley. 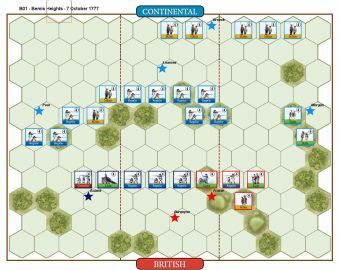 Burgoyne’s march south was more difficult than expected giving the Continentals time to set up a defensive position on Bemis Heights. 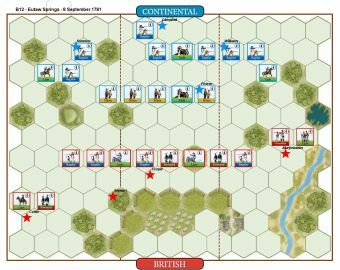 On the morning of the 19th, Burgoyne was within a few miles of the heights and ordered the army to advance. 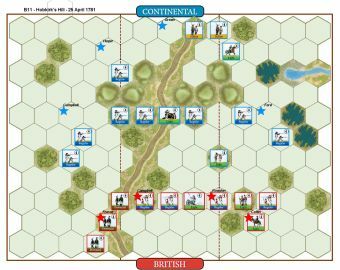 Fraser would turn the American left flank by negotiating the heavily wooded high ground north and west of Bemis Heights while Hamilton would make a frontal attack on the heights. 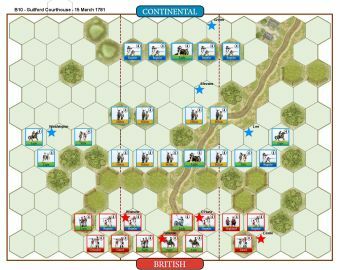 Arnold realized such a flanking maneuver was likely, and petitioned Gates for permission to move his forces forward from the heights to meet this potential flanking movement. 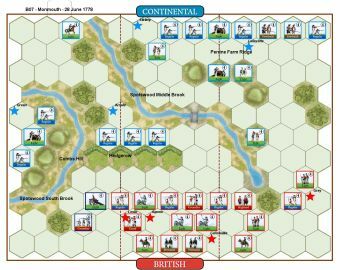 Gates grudgingly permitted Arnold a reconnaissance force, which met the British advance near Freeman’s Farm. 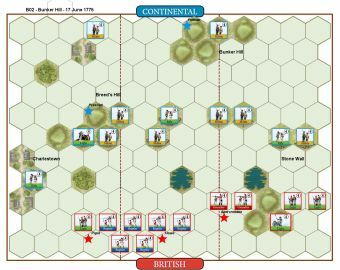 The battle went through phases alternating between intense fighting and breaks in the action. 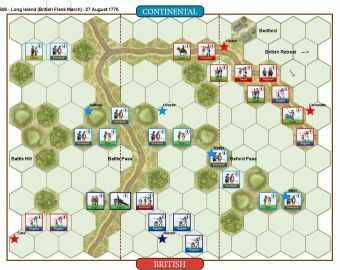 It finally turned in favor of the British, when Riedesel and the German troops arrived and threatened to turn the Continentals flank. 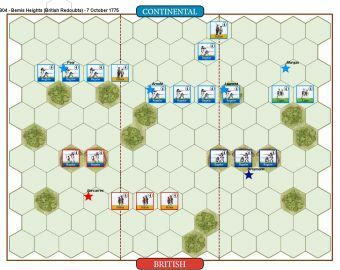 But as darkness began to set in, the Continentals retired back to their defenses, leaving the British on the field. 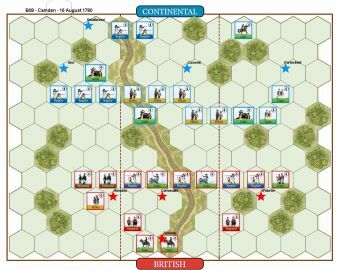 • Move First - To determine which side will move first, both players must select one Command card from their hand. At the same time, these cards are revealed. 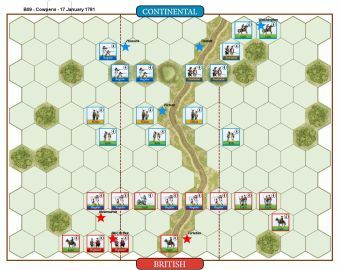 The player’s card, that orders the fewest number of units and leaders, will move first, using the card that was selected. The opponent will use his selected Command card and take the next turn. 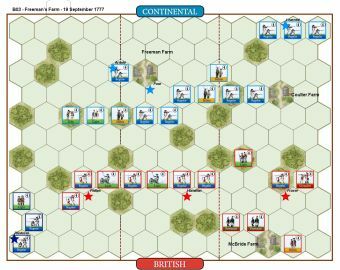 An easy 7-3 British win with the Brits playing Line Volley after Line Command after Line Volley to decimate the American line and finish it with the bayonet.